The program is called the Treatment of Ten. 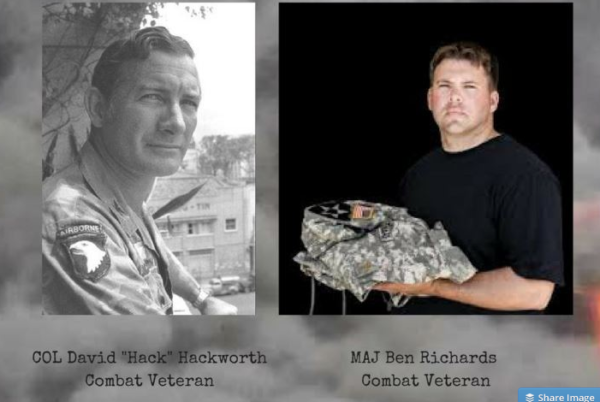 SFTT, founded by the legendary war hero COL David “Hack” Hackworth, is helping to raise $150,000 to help these brave Veterans get the therapy they deserve. Some of these therapies are currently denied Veterans at the VA because of their entrenched bias against Hyperbaric Oxygen Therapy (“HBOT”) and other alternative treatment therapies. Sadly, the VA treatment offered to our Veterans for PTSD and TBI is shameful as amply documented by previous articles and blog posts published by SFTT. In his own words, Maj. Ben Richards describes his experiences with the VA and explains that there is hope for Veterans and their caregivers who suffer from terrible brain injury. Sadly, this non-invasive therapy is not available at the VA and won’t be anytime soon. Found below are some of the non-invasive therapies that these Veterans in the Treatment of Ten will receive over an eight week period at an HBOT facility in Idaho. Maj. Richards plans to use these results to develop a template for other communities and medical facilities to adopt the same procedures in helping Veterans cope with debilitating brain injury. Your support is needed to help with fund this initial program. Unlike many other Veteran support programs, 100% of ALL contributions go to support the TREATMENT OF TEN. If you want to truly support Veterans, please make a contribution now by CLICKING THIS LINK. Let’s give our Veterans a chance to reclaim their lives.